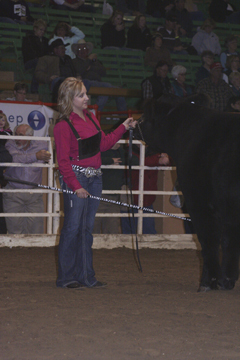 Morgan Burke exhibits her steer Niko during the showmanship contest. Preparation, dedication and hard work are qualities that many students who have livestock must adhere to in order to succeed at showing their animals. For Morgan Burke, these are the same qualities that allowed her to bring home the title of Reserve Champion Senior Beef Showman at the National Western Stock Show. Burke has been around cattle her entire life. “I have been showing as long as I can remember. I can never remember a time where I was not showing,” said Burke. A native of Nebraska, Burke lives with her family in Genoa, and goes to high school at Lakeview High School in Columbus. Her family runs a cow/calf business, but showing is where her true passion lies. “I like how it’s really your hard work that shows whether you do good or do bad. I like all the people I have met and contacted through showing. I also like the work at home. I’ve learned a lot from it, especially how to be responsible,” she said. Discipline has helped Burke to manage her time, as she is involved with showing, 4-H, FFA, Student Council, Future Business Leaders of America, National Honor Society, Senior class secretary, and yearbook and school newspaper editor. Every day she worked with her steer, who she named Niko. She has had him since April, and prepared him for this show with a little work each day. “The best thing you can do is spend time working with them, and get to know their personality. Showmanship takes a lot to get the cattle calm enough. You can teach them to be calm through washing and the general time being around them,” she said. Burke competed in the showmanship contest at the National Western Stock Show held in Denver, Colo., in January. Finishing second was a big honor for her, as she has attended the stock show for many years and competed. “It’s nerve racking during showmanship, especially at Denver, because so many people are watching. It takes a lot of time to prepare,” she said. However, her preparation paid off. The judge, Ben Cooley of Sterling, Colo., commented that she was the most consistent exhibitor, and that she did a great job. If it wasn’t for the one question that Burke missed, she would have been the champion. “The question I was asked is a question I will never forget. The judge asked me what the average dressing percentage was for cattle, and I didn’t know the answer. That’s what beat me,” she said. Even though she didn’t win, she feels happy with her performance. 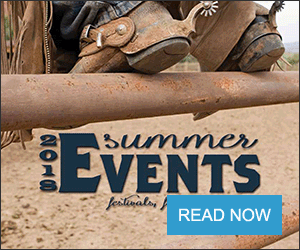 “In showmanship, I like that it doesn’t matter how much you spend on your cow or who you are. It’s about how you are showing and how you present the calf. All of the responsibility is on your shoulders. I believe that showing makes a big difference on how your calf does. It’s good to know the judge congratulates you on your hard work,” Burke said. Since she is 18, this year will be her last year to be eligible to show in market classes, and at county and state fair. However, since her family raises show cattle, she will not be leaving the industry. The family holds a production sale each fall, and they sell prospect calves for others to show. “For the sale, we have to get them washed, and get them clean. I remember when I was younger, I remember getting up at 3 in the morning to wash them to get them ready,” she said. In addition to her family’s herd, she also has a small herd of her own. “Most of mine are ones that I have shown. I like heifers better than steers, because you can keep them and start having calves. I’ve had two heifers every year since I was 8. So for the past 10 years I have adding to my herd. That has helped me quite a bit,” she said. Burke plans to attend college in the fall, and will continue to help her family manage their cattle operation. Burke was not the only Nebraska student to place at the stock show. Many more student competed, and did not place. In the market lambs, four students placed, including Casey Lynn Huckfedt of Gering, Chandler Schelkopf of Geneva, Ryan LiaKos of Bayard, and Schila Strain of Morrill. The hog show had the largest turnout of Nebraska students, with seven students placing. The students were Brandon Wallander of Berthrand, Lauren Kaliff of York, Travien Motis of Geneva, Thane Motis of Geneva, Creighton Hirschfled of Benedict, Josh Alfs of Shickley, and Regan Gittlein of Wauneta. For the crossbred market steers, five students placed. That included Hailey Keller of Kimball, Katie Weinrich of Wakefield, Naleigh Gehl of Ericson, Kodi Gehl of Ericson, and Josh Taylor of Loomis. In the crossbred market heifers, Sydney Gehl of Ericson were the only Nebraska competitor to place. The NWSS is the only major stock show that also offers an auction. Of the hundreds of animals shown, only the top 90-100 will make the sale, across all breeds. For each animal that is sold, 10 percent of the proceeds are donated to the National Western Scholarship Trust, which gives financial aid to students in college. This year, 74 scholarships were awarded. 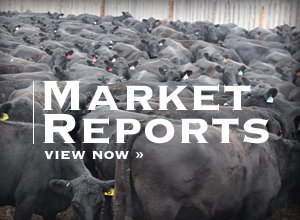 The Auction of Junior Livestock Champions saw a large increase in prices this year, and a record of $611,000 was raised. The previous record was set in 2006, with a total of $592,707, according to NWSS records. A total of 98 animals were sold. The high seller of the night was the grand champion market steer, who brought $106,000 and was bought by Ames Construction. The steer, shown by Baylor Bonhon of Newcastle, Okla., was the second highest selling animal in the history of the auction. Last year’s champion sold for $50,000. The reserve champion market steer was show by Gracie Russel of Prescott, Iowa. This steer sold for $45,000. The grand champion market goat was exhibited by Daleanna Juul of Manzanola, Colo., and was sold for $26,000, up from $11,000 last year. The reserve champion was shown by Hunter Huval of Breaux Bridge, La., and brought $12,000. The grand champion hog, show by Taylor Walker of Spring Branch, Texas, was sold for $25,000, up from $11,000 last year. The reserve champion, exhibited by Clay Combs of Lometa, Texas, sold for $15,000. The grand champion lamb brought $24,000, and was up from $15,000 last year. The lamb was shown by Luke Davis of Guthrie, Okla. The reserve champion lamb was exhibited by Shaylyn Price, Edgewood, N.M., who sold her lamb for $21,000. Kodi Gehl of Ericson, Neb., was the only Nebraska student to make the sale. Her steer sold for $7,000.